The Apple stock price dove 8% last night (Tuesday) after the tech giant missed badly on its fiscal Q2 earnings reported after the market close. Although a decline in iPhone sales, earnings, and revenue had been anticipated for months, the numbers Apple Inc. (Nasdaq: AAPL) reported were significantly worse than Wall Street's forecasts. 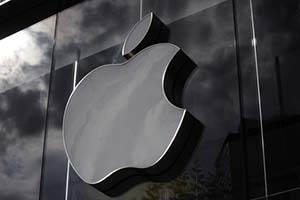 Apple said earnings per share (EPS) were $1.90, well off the analyst forecast of $2.00. Revenue of $50.56 billion also was short of expectations for $51.97 billion. It marked the first year-over-year revenue drop for Apple since 2003. The main cause of this earnings pain was a steep decline in iPhone sales, from 61.17 million in the same quarter a year ago to 51.19 million. And there weren't a lot of bright spots to offset the glum iPhone numbers. Mac sales declined 9% from a year ago. And iPad sales were off 19%, continuing that product's decline. Apple further distressed investors with lowered guidance for its fiscal Q3. The company forecast revenue of $41 billion to $43 billion, while the analyst consensus had been for sales of $47.42 billion. The barrage of bad news sent the AAPL stock price into a tailspin in after-hours trading from its closing price of $104.35 to below $96. The Apple stock price today (Wednesday) has struggled to recover. By midday, AAPL stock was hovering around $98, down 6%. The downbeat numbers have raised concerns that have dogged Apple since 2012. The buzz among the pundits is whether this signals the end of the Apple growth story. First, let's be clear: The Apple Q2 earnings were awful, to be sure. But investors need to understand why they were awful, because that will tell us how serious Apple's issues might be. The tough compare: The iPhone 6 models, with their larger screen sizes, sold in extraordinary numbers. Many folks upgraded early to get them, moving would-be iPhone 6S upgrades this year forward. Next year's iPhone 7 models won't face this problem and will have the advantage of being a "major" upgrade like the iPhone 6. The strong U.S. dollar: Like many multinational companies, Apple has been hit hard by the strong U.S. dollar, which makes U.S. goods more expensive overseas, eating into profits. This, too, won't last forever. No iPhone 5SE: The smaller, less expensive iPhone 5SE was released on the last day of the quarter and so wasn't included in the Q2 sales numbers. In the analyst conference call, CEO Tim Cook said that demand for the new discount iPhone was exceeding supply. In other words, don't fret too much about this quarter because things will get better – eventually. The next two quarters won't be so great while the world awaits the iPhone 7, but watch for much better earnings in Apple's fiscal year 2017 (which starts Oct. 1). Lost in the wailing over the lousy Apple Q2 earnings is that the company is still a moneymaking machine. Apple made $10.5 billion in profits in Q2 – more than the annual profits of all but 15 Standard & Poor's 500 companies. And while Apple isn't likely to double earnings anytime soon, it will return to growth in 2017. Cook said he's optimistic that Apple will be able to increase iPhone sales in China as well as the younger smartphone market of India, with the iPhone 5SE helping achieve that. Apple also has quietly grown revenue from its services business – now the second-largest contributor after the iPhone. Sales from services grew 20% to $6 billion in Q2 and are expected to double by 2020. Cook noted in the conference call that Apple has more than 1 billion active devices – a source of revenue growth Apple is now focusing on. "What people are missing is that the company is wrapping its future around everything from social media to mobile computing, data, and entertainment – not devices," said Money Morning Chief Investment Strategist Keith Fitz-Gerald. "That's all stuff that isn't properly reflected in the Apple stock price… but will be very shortly." From the 30% gain in "Other Products," we can also deduce that the Apple Watch must be selling respectably, although Apple continues to decline to break those numbers out separately. The fact is, Apple is a large, stable company that makes tons of money and pays a dividend with a respectable 2.35% yield (Apple raised the dividend payout 10% to $0.57 yesterday). With the AAPL stock price at $98, it's almost a no-brainer buy. Just about all the negativity is now priced into the stock. According to Morningstar data, Apple is expected to earn $10.28 per share in its fiscal 2017. With a price/earnings ratio of just over 12, that would get the Apple stock price to $125, a 27.5% gain. And that's not counting the dividend. "Apple's Q2 earnings, under the circumstances, are nothing more than a short-term speed bump and a chance for investors to get on board at a discount before anxious sellers realize the error of their ways," Fitz-Gerald said. The Bottom Line: Apple's terrible quarter has taken a toll on AAPL stock as investors walk away. But the year-over-year comparisons really aren't fair given the blockbuster success of the iPhone 6 the year before. A sober look at Apple's business shows the company is an excellent value right now, and that investors should buy before the Apple stock price ticks back up. I agree they will rebound.